Starbucks recently announced that it is expanding its cold brew menu item to participating stores across the country. Chicagoans have been able to purchase Starbucks cold brew since March, as the city was part of the company's soft introduction to stores in the Northeast, Mid-Atlantic, and Midwest. 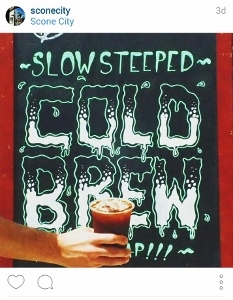 I'm glad Starbucks has introduced cold brew--a far superior method of producing chilled coffee than pouring ice into a cup of hot, double-strength brew--to the masses, but specialty shops in Chicago have been serving cold brew for years. The next time you're craving the smooth, concentrated flavor of cold brew, consider trying one of these shops. Justin Doggett of Metropolis was recently on WBEZ to talk about cold brew, and this shop pours a pretty good cup (and I hear they are going to start selling it in bottles soon). It's fairly roasty with strong notes of chocolate. They even sell special cold brew blends so you can make yourself a cup at home. There is nothing better to pair with your Cherry Almond scone (or Maple Bacon scone or Cinnamon Chip scone) than a delicious cup of cold brew. This place just opened a few weeks ago, and its cold brew is perhaps the best I've had. I sampled the Rwanda, and it was rich, earthy, with hints of an unexpected (but fantastic--I can't stress this enough) tomato flavor. Not only can this place fulfill your bike-related needs, it also sells refreshing cold brew...by the growler! Don't talk to me about cold brew trends unless you've tried nitro cold brew, which is coffee mixed with nitrogen. People say that the nitrogen gives the coffee a thicker, creamier texture, something akin to a dark beer. Go ahead. Try it. Ipsento has this one on lock. Of course, this list is just a start. Where do you go for your cold brew? Bowtruss has an amazing cold brew! I sometimes make it at home now, since I have found a simple pot that eliminates the mess of wet coffee grounds. It's a Japanese pot made by Hario. I'm going to buy some of that Metropolis cold-brew blend. The best cold brew in the city is at Cafe Blue (serving Halfwit coffee) on Halsted and Chicago. Steve -- I actually haven't tried Bowtruss's yet, but I will have to get on it! Nancy -- Isn't homemade the best? Sally -- I haven't heard of Cafe Blue! Scone City also uses Halfwit. I will have to try and compare. Do you know if Cafe Blue uses the Moonbat blend? Any list missing Dark Matter's Chocolate City is a darn shame!